I don't know - you wait all year for a film about 19th century magicians, and then two come along at once. But can The Illusionist match the dazzling sleight of hand of Christopher Nolan's theatrical triumph The Prestige? For those of you in a hurry, the answer's no. But that's not to say that The Illusionist has nothing to recommend it. For a start, it has EastEnders' Max Branning (Jake Wood) in a bowler hat, talking in a crap German accent, which is worth the price of entry alone. But seriously, there's much about this quaint fairy tale to please. 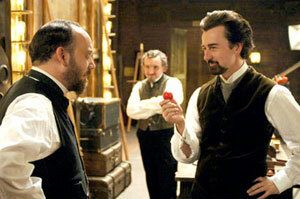 The Illusionist in question is Viennese magician Eisenheim (Edward Norton). Separated from the love of his life when just a teenager, he embarks upon a mythic quest to the Far East to discover the secrets of the magicians of the Orient and perfect his own skills. Returning to Vienna, he wows audiences with his seemingly impossible feats of fantasy (although try not to laugh at the World's Strongest Butterflies - we tried, but failed miserably) - and discovers his childhood sweetheart once more. 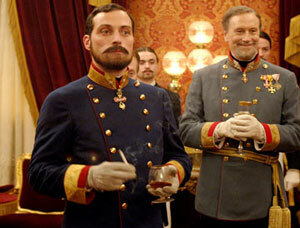 There's just one problem, though: she's now engaged to the Crown Prince of Austria, the ambitious, aggressive Leopold (Rufus Sewell in typical intense mode, sporting a suitably dastardly beard and 'tache). It doesn't take long for Eisenheim to find himself on the ruthless monarch's blacklist, his every move dogged by the prince's chief of police, the self-professed amateur conjurer (and, it would seem from his woeful attempts at detection, amateur sleuth as well) Inspector Uhl (Paul Giamatti). Growing an orange tree from a pip in fifteen seconds is one thing, but can our taciturn hero use his skills to achieve the truly impossible: winning the hand of a lady way out of his league? For while The Prestige was a dark tale of driving obsession and bitter rivalry, the gentler Illusionist is instead a classic storybook romance: the tale of the beautiful princess (okay, duchess, in this case) and the resourceful peasant boy who deceives the court in order to win her love. As if to emphasise this, the film is tinted with warm, slightly fuzzy, sepia tones, its scenery as charming and artificially looking as a stage backdrop, its special effects as deliberately artificial as a CGI cartoon, its Philip Glass soundtrack a soaring, swooping, romantic dream. This marriage of romance and artifice is beautiful and appealing, but in the end there's nothing terribly magical or mysterious about this tale of, er, magic and mystery, nothing that really makes the hairs stand up on the back of your neck anyway. In fact the only truly baffling thing is why it takes Inspector Uhl the entire film to work out what to us seemed obvious from the start. (That and why everyone has to talk with silly accents just because the film's set in Austria.) Still, it's a pleasant enough way to spend an evening, even if it is at times mesmerisingly slow. But you'll like it. Not a lot. but you'll like it.